Companies are leaning hard on their logistics leaders to drive competitive advantage through innovation and efficient execution. 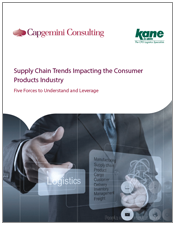 Consumer product companies that are planning logistics budgets and initiatives would be wise to consider major trends that will shape how their supply chains will operate in the future. This paper looks at five forces that will undoubtedly impact your logistics operations in the future. It's wise to understand these forces and consider the actions you can take now to stay one step ahead.